This Transceiver Set inlcudes a Bolt Pro 600 3G-SDI/HDMI Transmitter and a Bolt 600 3G-SDI/HDMI Receiver. 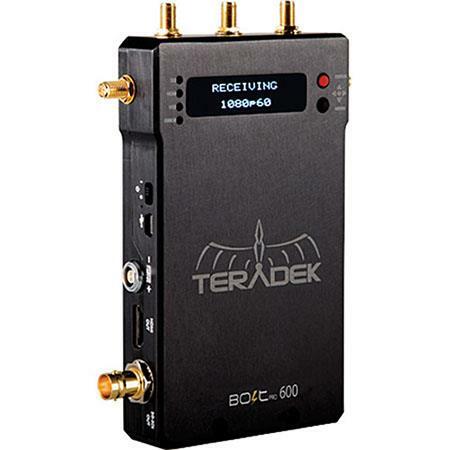 The Teradek Bolt Pro 600 RX SDI/HDMI Wireless Video Receiver features an OLED screen for quick RX pairing, manual frequency selection, external antennas and a transmission range of up to 600' line of sight. 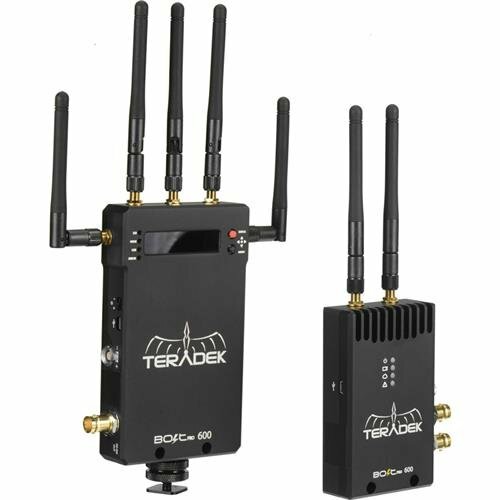 The Teradek Bolt is a zero delay (< 1ms) wireless video system that transmits uncompressed 1080p60, 4:2:2 video up to 2000' over the unlicensed 5GHz band. All Bolt models are multicast capable up to 4 receivers, support timecode and metadata pass through and include the USB 3.0 GRAB Engine. Capture cards are a thing of the past with Teradek's new GRAB Engine. Every Bolt RX includes a USB 3.0 output that allows you to ingest Bolt's uncompressed video feed directly into a computer or DIT cart with no added delay. It supports real-time format conversion from TX to RX, allowing you to automatically cross convert from HDMI to 3G-SDI (or vice versa) without any extra hardware. The model also outputs a test pattern when the video signal is lost. It supports quick RX pairing via the OLED screen and manual frequency selection.